When the folks at Supergiant Games, they of Bastion and Transistor fame, announced their next game was going to be a magical sports game, there were lots of questions about what that would actually mean. That games is Pyre, and what it has meant is that Supergiant are now three for three in my book when it comes to creating wonderful, captivating, indie games. 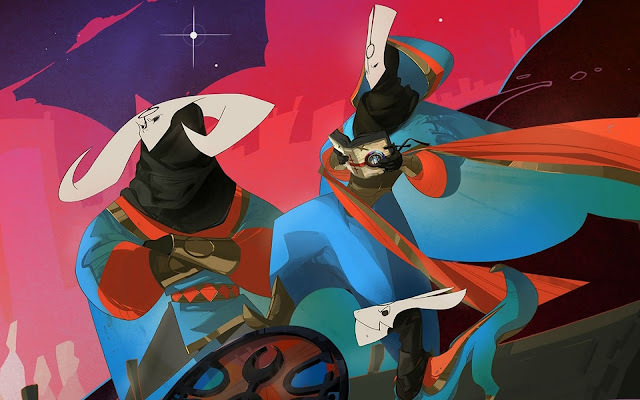 I wanted to give Pyre a post all of it's own because I think what Supergiant achieve with their games as a design studio is worth exploring and applauding. I think it's interesting that all three of their games play totally differently, offer brilliantly unique worlds, yet also feel like they are spiritually bonded experiences. That actually takes some doing. This is a studio that has a certain design philosophy and leverages it not to merely attempt to repeat a previous success, but to forge a new success each time they make a game. Their games are unique, yet share and maintain an identifiable style that is undeniably theirs. While each game world has been unique, the format has maintained a consistency that helps breed a familiarity for fans that helps with the immediate appeal. It's almost like the way in which the Final Fantasy games are all unique, but are also all identifiable as belonging to the franchise. So Pyre does share many of the same pillars as both Bastion and Transistor. Strange, unknown world with a central mystery you don't understand at the start of the game? Check! Sections of cryptic or unreliable narration that reveal the story as you progress? Check! A cast of oddball characters with backstories that are peeled back as you progress? Check! A game system that offers a compelling selection of upgrades to keep you playing? Check! A floating, haunting soundtrack, perfectly paired with the aesthetic for that game? Check! It's more like a cooking technique rather than a specific recipe. They have created a different meal every time, yet it still feels like it came from the same chef or restaurant. The game mechanics have been dramatically altered between each game. 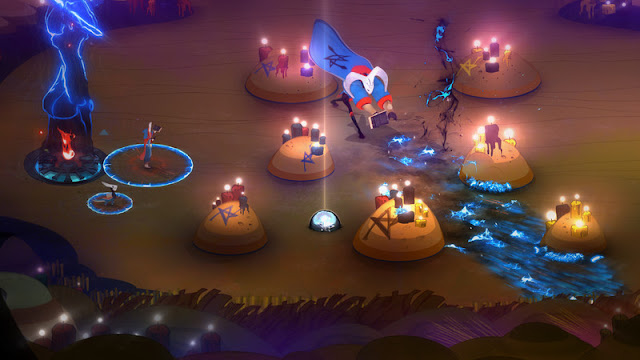 Pyre is in effect a sports sim at it's core. It probably owes more to the immediacy of the 16 bit era and the likes of the early NBA Jam games than it does the modern layered EA sims, but it is still uses the same core loops as a sports title. They take chances, and can do so, because their overarching approach ensures that the game will still 'feel' like a Supergiant game. That breeds a very powerful confidence. So in effect, rather than being restrictive, having those top level design beliefs solidified, grants them this tremendous freedom of expression in their design. I might be off base, but from the outside looking in, the folk at Supergiant seem to share a lot of the approaches that we hold dear at Blizzard. So maybe it's not a surprise that these games have resonated so strongly with me. I appreciate any studio that are confident enough to evolve their designs, and even experiment, while still producing consistently evocative experiences.